The Blue-winged Teal is a small handsome duck of shallow ponds, breeding across much of Canada and the northern and central United States. Scattered numbers breed as far south as Tennessee. In the winter, small numbers can be found along the southern coast, but the majority migrate to Mexico, Central America, and especially northern South America. They are commonly found in Tennessee during migration; from late February to late May in spring, and from late October to late December in fall. Description: The male of this small duck has a blue-gray head with a large white crescent, the body is cinnamon-brown, and the hind end is black with a white patch on the rear flank. The female is gray-brown overall, with a small white area at the base of the bill. In flight, both the male and female have a light blue upper wing-patch with narrow white border, and an iridescent green trailing edge. Voice: The female’s quacks are loud and evenly spaced. The male's call is a thin, high whistle. Female Green-winged Teal lack the blue wing-patch, are a warmer brown, and have no white near the base of the bill. Male Northern Shovelers have a blue wing patch, but are also much large, have a huge bill, and a white chest. Habitat: Marshes, ponds, and shallow lakes. Diet: Aquatic invertebrates, seeds, and plants. 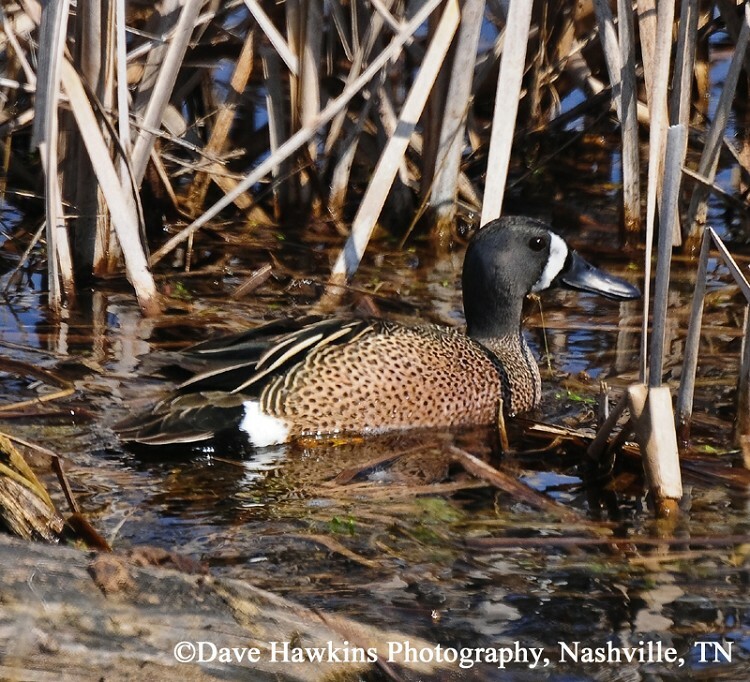 Nesting and reproduction: There are very few nest records for Blue-winged Teal in Tennessee. Clutch Size: Usually 10 eggs, with a range of 6 to 14. Incubation: The female incubates for about 24 days. Fledging: The young leave the nest shortly after hatching and can fly in 5 to 6 weeks. Nest: The nest is a bowl scraped into the ground and lined with vegetation and down. Status in Tennessee: The Blue-winged Teal is a common migrant across the state and rare in summer and winter. In fall they are most frequently encountered from late October until late December. Spring migrants arrive by late February and can be found until late May. The Blue-winged Teal is the second only to the Mallard as the most abundant duck in North America. There was an effort to increase the number of breeding Blue-winged Teal in Tennessee in the 1970’s. TVA and TWRA released farm-reared young teal in ponds surrounded by pasture. The project was discontinued due to problems with captive breeding. The oldest known wild Blue-winged Teal was 23 years, 3 months old. Best places to see in Tennessee: During spring and fall migration Blue-winged Teal can be found in marshes, ponds, and shallow lakes across the state. Rohwer, F. C., W. P. Johnson, and E. R. Loos. 2002. Blue-winged Teal (Anas discors). In The Birds of North America, No. 625 (A. Poole and F. Gill, eds.). The Birds of North America, Inc., Philadelphia, PA.